The Leela Mumbai includes two bars and four restaurants, one of which is open 24 hours a day. The hotel also offers a freeform outdoor pool, a full-service health spa, and a spa tub. Accommodations at The Leela Mumbai include minibars and refrigerators, bathrobes, slippers and complimentary toiletries, as well as 32-inch flat-panel plasma TVs with premium cable channels and DVD players. Rollaway beds are also available. Connecting/adjoining rooms are available, subject to availability. This 11-acre Mumbai hotel includes gardens, waterfalls, and a free-form outdoor pool surrounded by lounge chairs and umbrellas. The Leela Mumbai has a health club, a full-service health spa, spa tub, and sauna. 4 restaurants offer a range of dining, room service is available 24 hours a day and there is a poolside bar. This Mumbai hotel offers wireless Internet access (surcharge), cell phone and computer rental, currency exchange, dry cleaning, and tour assistance. The business center is open 24 hours a day and has a meeting room. Coffee and newspapers are complimentary in the 3-level lobby. 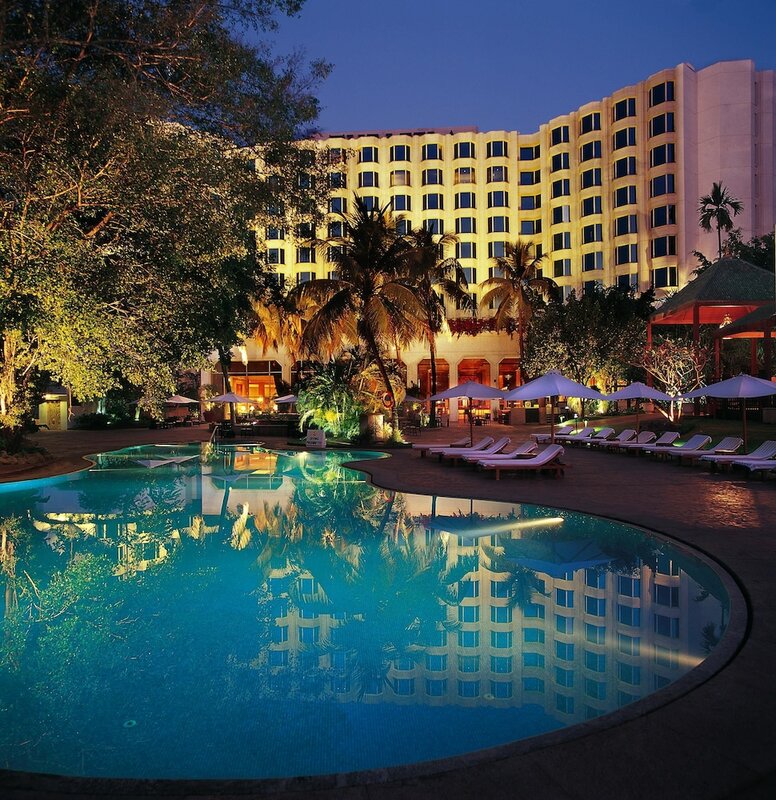 Guests at The Leela Mumbai can also take advantage of the 24-hour transfer service from the airport (surcharge). Citrus - Restaurant with show kitchen. Open 24 hours a day, with buffet and a la carte options. Serving breakfast, lunch, afternoon tea, and dinner. View of gardens and waterfalls. Jamavar - Fine dining, serving north and south Indian cuisine. Serving dinner. The Great Wall - Serving Chinese dishes for lunch and dinner. Floor-to-ceiling windows, overlooking the garden and a waterfall. Located on the lower lobby level. Stella - Italian dishes, served in a fine-dining atmosphere. Extensive wine list. Located on the eighth floor. Formal dress code. Children younger than ten years old are not allowed. The Leela Mumbai includes a health club, a sauna, a spa tub, an outdoor pool, and a children’s pool. The Spa offers European, Asian, and Ayurvedic spa treatments, including facials, body scrubs, energy work, and massage. Please note that a total of 5 or more rooms, booked through one/several online and voice channels irrespective of the no. of room/s booked at the same hotel and/or when they are booked, either in the name of one guest and/or several individual names and for stays overlapping on at least one common date, shall be considered as group travel, and shall be treated in contravention to the hotel’s policy of distributing rates through online and voice channels for individual stays only. Such reservations, whenever identified prior to check-in, will be treated as null and void and will be cancelled instantly, without any prior intimation. Alternatively, such bookings identified post check-in, will be charged additionally on check-out as per the decision of the hotel management and the additional charge will be binding on the travelers. The hotel management will not be responsible for any inconvenience or financial implications caused to any such member/s of this group and shall remain indemnified. Rollaway/extra beds are available for INR 1500.0 per night.